The quality of your footwear affects more than just the comfort of your feet. You may not realize it, but back pain, aching knees, and a host of other physical discomforts can arise from neglecting the comfort of your feet. Haflinger believes that a comfortable foot helps properly support the entire body, and we build our clogs with the goal of relieving your pain. Haflinger clogs, first produced over fifty years ago, are designed with many features to maximize the comfort of your foot. 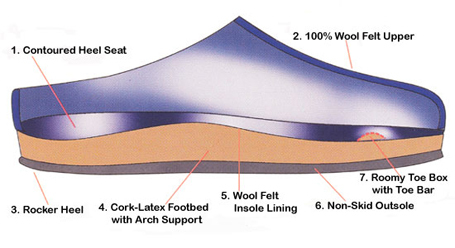 The footbed is made from natural cork and latex that will support your body for the long term; they don’t just provide a soft cushion that will quickly wear away. Wool, nature’s insulation, keeps the foot warm while allowing the feet to expand and contract with total freedom. Haflinger offers boiled wool slipper clogs, outdoor sole slippers, and “Grizzly” wool felt clogs, all featuring natural latex support and luxuriously padded double felt soles.